Affordable, reliable, compact, and fast describes Rosetta Technologies' top-of-the-line 22 page-per-minute MICR laser printer for check printing applications and more. This laser printer gives you a lot more for a lot less than you expect. You can rely on the BP20/BP20N MICR series to deliver the quality you need in your business critical documents without jeopardizing your budget. If you are interested in cost-saving measures for your company that won't sacrifice functionality, you should evaluate the features of this impressive MICR laser printer. The versatile Rosetta-engineered Ricoh BP20/BP20N monochrome MICR laser printers are designed for cost-conscious businesses with low-volume MICR printing requirements. Use a MICR cartridge when you need to print checks and a standard cartridge for other business needs. If networking is critical to business operations, BP20N MICR printer is the answer. 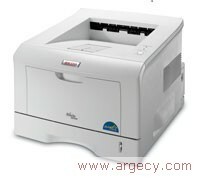 The BP20 MICR printer is a straightforward, reliable MICR laser printer solution that meets all your business needs. The The Rosetta BP20/BP20N MICR packs 22-ppm printing power into an easy-to maintain design that fits comfortably on the desktop. The standard 250-sheet paper tray minimizes paper handling. Need greater capacity to manage increasing volumes? Add the 250-sheet Paper Feed Unit for a total of 550-sheets to maximize printing productivity. Built to handle the workload of business environments, the dependable BP20/BP20N is designed to support the production of thousands of pages every month. Replacing the 5,000-page MICR toner cartridge is fast, clean and easy, so the Rosetta BP20/BP20N is always ready when needed. The BP20 model offers standard USB 2.0 and Parallel interfaces for direct connection to a Windows PC. The BP20N model adds a standard 10/100BaseTX Ethernet network card so multiple users can access the printer at once and drive down the cost of printing. Either way, the printers' fast processor and expandable memory capacities handle large files with ease and make short work of every job to eliminate data bottlenecks. What's more, both models use the popular PCL6 page description language and driver for simple point-and-click operation by every user. Scale images to fit several pages on a sheet, control print quality, add watermarks, create posters, feed stacks of envelopes and more whatever you need to keep your business in business. Dimensions (WxHxD) 12.09" x 18.38" x 10.94"